When you speak of famous Scots George Bennie might not spring to mind. Born in Glasgow in 1891 he was a keen inventor and was granted several patents, relating to air-travel, in the 1920s. The Railplane was a electrically-powered, propeller-driven form of transport which was to be suspended above existing rail lines, allowing passengers to travel faster than freight trains below. Despite not receiving any early backing for his project, Bennie pushed ahead with a full-size demonstration track near Milngavie. Although there was some interest in his project nothing ever materialised and he was ousted from the Board of the Railplane company in 1936. 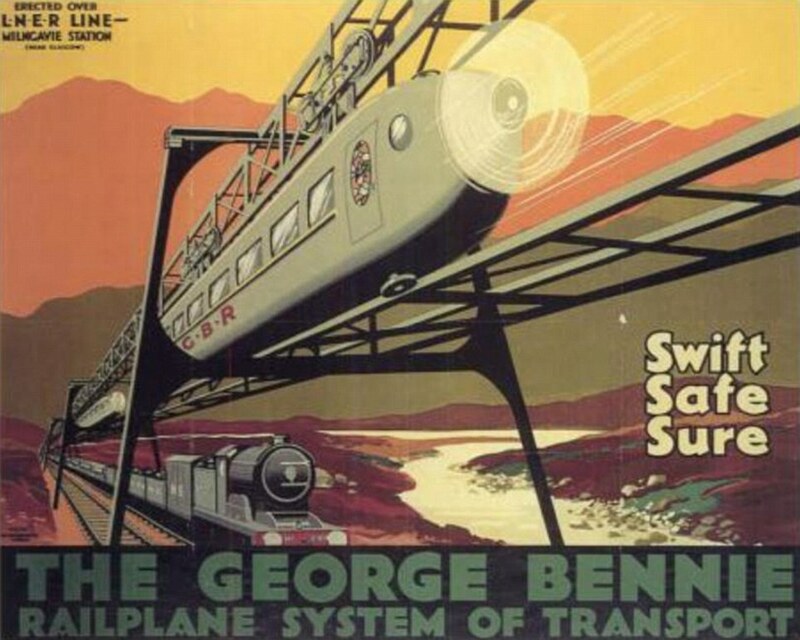 In 1937 he was declared bankrupt but recovered to set up two new companies – George Bennie Airspeed Railway in 1946 and George Bennie Airspeed Railway (Iraq) in 1951. His plan with these companies was to set up rail links between city centres and airports. Like his earlier projects, these came to nothing. The demonstration site survived the Second World War, despite having a lot of reusable metal which would have been in demand. It was finally demolished in 1956.